Mario J. Molina, a professor at the Massachusetts Institute of Technology who won the 1995 Nobel Prize in Chemistry for his role in elucidating the threat to the Earth’s ozone layer of chlorofluorocarbon gases, or CFCs, will join the faculty at the University of California, San Diego. Molina, UCSD’s sixteenth Nobel Prizewinner, will be a professor in UCSD’s Department of Chemistry and Biochemistry and in the Center for Atmospheric Sciences at Scripps Institution of Oceanography when he arrives on July 1. He will join a group of leading atmospheric chemists at UCSD that includes Paul Crutzen, who shared the 1995 Nobel Prize in Chemistry with Molina and F. Sherwood Rowland of UC Irvine for their work on the chemistry of atmospheric ozone. Molina, a native of Mexico whose early research with Rowland convinced governments around the world to eliminate CFCs from spray cans and refrigerators, has focused much of his recent research on the chemistry of air pollution in the lower atmosphere. He has been working with collaborators from other countries, most notably colleagues in Mexico City, on assessing and mitigating the air pollution problems of rapidly growing cities around the world. “With this appointment, UCSD and Scripps scientists are uniquely positioned to understand global changes in the atmosphere from the molecular scale to the global scale and tackle regional scale problems ranging from air pollution to climate change in important regions such as China, India, Mexico and USA,” said V. Ramanathan, director of the Center for Atmospheric Sciences. Born in Mexico City, Molina received a bachelor’s degree in chemical engineering from the Universidad Autónoma de México in 1965, a postgraduate degree in 1967 from the University of Freiburg in West Germany and a doctorate in physical chemistry in 1972 from UC Berkeley. As a postdoctoral researcher in 1974 at UC Irvine, he was a co-author with Rowland of a paper in the journal Nature that detailed their research on the threat to the ozone layer in the stratosphere of CFCs, then widely used as propellants in spray cans and as refrigerants in refrigerators. 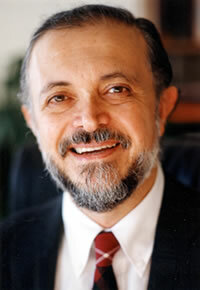 He held teaching and research positions at UC Irvine, the Universidad Nacional Autónoma de México and the Jet Propulsion Laboratory at the California Institute of Technology before arriving at MIT in 1989 as a professor in the Department of Earth, Atmospheric and Planetary Sciences and the Department of Chemistry. He was named MIT Institute Professor in 1997. He is a member of the National Academy of Sciences, the Institute of Medicine and the Pontifical Academy of Sciences. He has served on the U.S. President's Committee of Advisors in Science and Technology, the Secretary of Energy Advisory Board, National Research Council Board on Environmental Studies and Toxicology and on the boards of U.S.-Mexico Foundation of Science and other non-profit environmental organizations.